Hi guys. Have some questions and looking for opinions. I have read the FAQ's and understand the basic setup for SS. 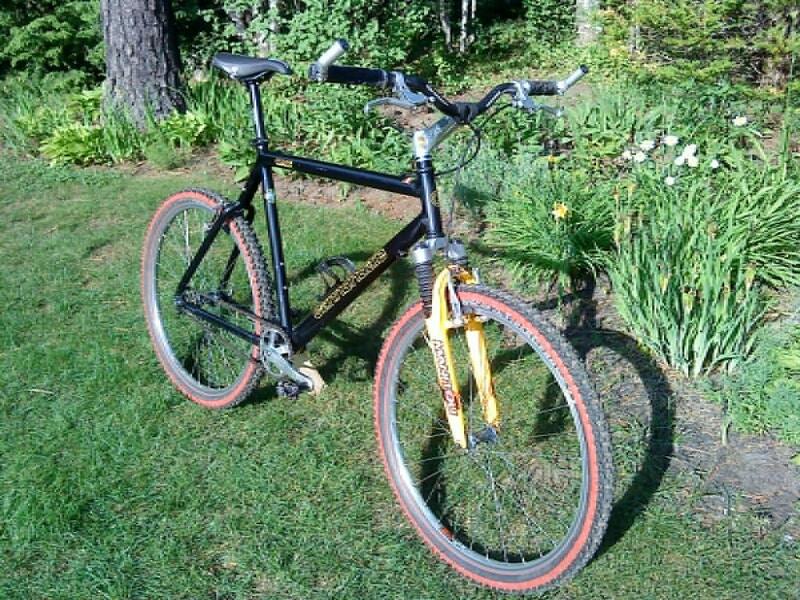 I'm using an old CAD3 Cannondale mountain frame for this conversion and it has a vertical dropout. I have decided on my front chain-ring size to be 34T (an old steel "engagement ring" chain-ring.) Do I need a 7-9 speed chain or single speed chain? Is there anyway to get around not using a chain tensioner? You can just use your current chain. You can get an ENO rear hub or Forward Components EBB. those are great options, but also very pricey. you can try to find the magic gear for your bike. it's the ratio (specifically the total tooth count) that gives you perfect chain tension without a tensioning device or eccentric hub or EBB. it requires lots of trial/error but it can be done. a half link will literally double your options and is much cheaper than a tensioner or eccentric hub. 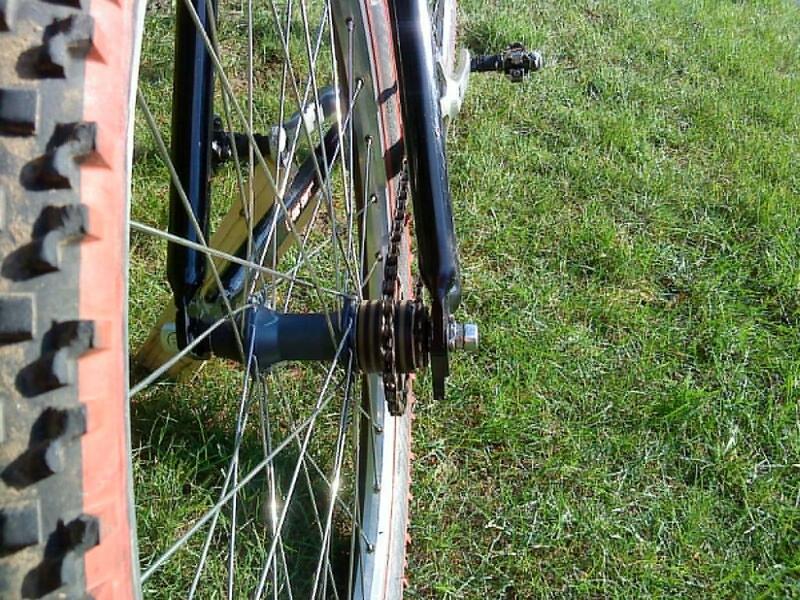 as a last resort, if you insist on not using a $30 tensioner, you will need to spend the money on a White Industries ENO hub or the Forward Components EBB like p_nut suggested. are you that against tensioners? "are you that against tensioners?" Nope, not at all, just looking for a clean look and trying to keep it simple. I'm looking for lowest cost option being that this bike will be only be fun and riding with my kids. Unless I was running fixed gear, I'd have no problems against tensioners. A tensioner seems to be the best/cheapest option. FYI, the ENO and FC EBB are in the $150+ range. And with the ENO, you must get the rest of the wheel built. Which means more $$$. the half link is by far the cheapest option, but not guaranteed. the tensioner is guaranteed to work, and only about $30-50. the ENO hub and EBB will both work, but are not exactly the "lowest cost option." I've got an SS Canondale conversion with an eccentric ENO rear hub. It's an elegant solution as well as a beautifully engineered object. Having said that, I'd probably go for a tensioner if I were less committed to single speed. You can always upgrade if (once) you become hooked. So last night I found the "magic" cog to accommodate the use of no chain-tensioner. I ended up with 34T and a 21T with little or no chain slack. I used the spacers from two old cassettes to set the spacing and installed a new chain. Everything works wonderfully except a little noise from the rear cog but considering it's used it probably take some time to "break-in". I went for a ride with the family on our local favorite twisty-rolling single track and boy was it fun. I kept finding myself looking to shift my old Grip-Shift shifters. LOL...As my Dad says all you need is two speeds; stand and sit down. Love this setup and probaly ride it more often than I expected.